CHIEW-SIAH TEI was born and raised in Tampin, a small town in southern Malaysia. 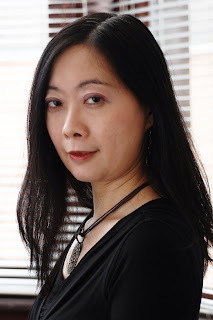 A bilingual writer, she has won a series of awards for her Chinese prose, including the Huo Zong International Chinese Fiction Award. She wrote the script for Night Swimmer, which won Best Short Film at the Vendome International Film Festival, and her play, Three Thousand Troubled Threads, was staged at the Edinburgh International Festival. She left for the U.K. to study in the 1990s, and now lives in Glasgow, Scotland. Her first novel, Little Hut of Leaping Fishes, published by Picador, was longlisted for the inaugural Man Asian Literary Prize in 2007. It’s a sweeping tale of sibling rivalry, cultural upheaval and the indelible power of blood ties, set against the dying days of Imperial China. What was it like growing up in Tampin, Negeri Sembilan? There was so much to do in a small town like Tampin in the 1960s and ’70s. Children had more freedom compared to their modern-day counterparts as their parents were mostly busy with work: shopkeeping, rubber-tapping, etc. Although I had to help my parents with chores and always tried to find time to read, I also ran wild with my playmates: trekking, catching fish in the river nearby, exploring places we were forbidden to go to, and the like. Getting close to nature, I think, helped nurture my creativity. I also enjoyed spending time at the local cinemas—two of them—and we kids would find ways for free shows. I was fascinated by screen images; perhaps my love for cinema began from there. I did a major in mass communication (journalism) and a minor in management for my first degree, media culture (film studies) for my master’s, and my PhD thesis was on creative writing and film studies. Was it a writing bursary that you received from the Scottish Arts Council? How did you get it? Yes, it was a writer’s bursary. The Scottish Arts Council offers writing bursaries to Scots and residents of Scotland. I was told of the bursaries by my tutors at Glasgow University’s creative writing course, found out the information from the Scottish Arts Council website and applied for it. When did you first decide to be a writer? Was it something you had always set your heart on? When I was ten, my first essay was published in the student section of a nationwide Chinese newspaper. It whipped up my interest in writing. However, as someone from a traditional Chinese family, I had never envisaged making writing my profession—it was unthinkable. However, after years of working since graduation, I realised something was lacking in my life and resolved to pursue my interest in creative work. What has the path to being published been like for you? How did you go about getting your novel published? Did you experience difficulty in finding a publisher? Some time in 2000, an author friend of mine gave a copy of the short film I wrote, Night Swimmer, to her agent, Toby Eady, of Toby Eady Associates. He liked it and asked to read my writing. I had nothing in English to show him then. When Little Hut of Leaping Fishes was completed in early 2007, I got in touch with him again and was glad to receive a positive response. Toby found me a publisher within 10 days; so I guess I am quite lucky compared to some writers. How did you arrive at the intriguing title, Little Hut of Leaping Fishes? ‘Leaping fishes’ symbolises my character Chai Mingzhi’s longing for freedom. In the old days, the scholars in China liked to name the place they studied in, such as the ‘Bamboo Villa’; I have my character name his sanctuary the ‘Little Hut of Leaping Fishes.’ This is the place where he has his first taste of freedom. The theme of ‘longing for freedom’ runs through the novel, from the little curtained corner of Mingzhi’s room, to the story of Taohua Yan (Peach Blossom Spring), to the cave he shelters his dog, to his private studies in Pindong Town, and eventually to his sea journey. Malaysian writers like Rani Manicka, Tash Aw, Tan Twan Eng and Preeta Samarasan set their stories in Malaya or Malaysia. Why did you choose to set your story in China? I think of myself as an international writer. I write what I feel deeply about. This book is quite personal to me. In 1999 I went to China for the first time, and for the first time realised I was different from the Chinese people around me in mainland China. I began to question: “Why, as a Chinese, do I live in Malaysia, and not China?” Of course, I knew then that my great-grandparents migrated from China to Malaya, but had never questioned the reason they left their homeland. In writing this book, I wanted to find out the reasons for the mass migration of Chinese to Southeast Asia at the turn of the 20th century. This helped me to understand what made me who I am—a Malaysian Chinese. Malaysian novelists all write from outside Malaysia. Does being outside of things here in some sense liberate you to write more honestly, and do you think you could have written the same book if you had stayed or lived here? I moved to Glasgow to be in a supportive environment to write this novel. I enrolled at Glasgow University’s creative writing course and received support from experienced authors and academics. In the meantime, an English-speaking environment was vital as I wasn’t confident with my English then. Being away from Malaysia helped to keep away unnecessary disruptions (family problems, for instance) and allowed me to concentrate on my writing. The possibility would be, there could never have been a book if I had stayed on as I wouldn’t have had the support I desperately needed to achieve my purpose. What is your fascination with 19th-century China? It was a turbulent era in Chinese history as the country went through a transition from being traditional to modern. The intrusion of the Western powers brought with them their cultural values and new knowledge, and the intellectuals, under these influences, felt the urge for reformation. The social, cultural and political conflicts resulted from the clashes of old and new values, the Western powers and the Qing Imperial government, and the natural disasters such as floods and droughts sent many Chinese people fleeing their homeland. This contributed to the creation of the multi-ethnic and multicultural societies of Southeast Asia. In short, what happened in 19th-century China has made me who I am, a Malaysian Chinese, hence the urge to understand this part of history. How much do you identify with your characters? For example, like the protagonist Mingzhi, do you ever feel torn between Malaysian Chinese and Scottish cultures? I don’t think this will ever happen to me. I am still very much a Malaysian at heart, and wherever I am, my Malaysian roots stay with me. Yes, sometimes when I am back in Malaysia, I feel a bit like a tourist as I don’t have a place of my own and don’t live my life there, but my family and friends always make me feel at home. What is your view of globalisation? Do you think it brings cultures together, or will there always be this sense of diaspora and not belonging? Globalisation brings people from different cultural backgrounds together. When this happens, the need to understand others and to be understood will, theoretically, result in assimilation. The reality is that the urge to look back to their origins often prompts the migrants and their next generations to return to their roots and their mother culture. Andrea Levy’s Small Island is one of such example, so are the writings of other descendants of immigrants. ‘Home’ and ‘belonging’ are themes I will continue to explore in my writings. How did you do your research? Did you have to travel to China to glean a sense of the Chinese landscape? I read historical books, biographies and autobiographies of persons living in the late 19th century, in both English and Chinese. The former allowed me to understand the happenings during that era, and being bilingual gave me the advantage of finding a balance between the perspectives of western and Chinese historians. The latter provided an insight into the details of ways of life, from cultural practices to social systems such as the examination system, to food and drinks, and costumes of the period. I also studied films and television series with similar settings. These allowed me, by exercising my imagination, to create the world of my characters and bring myself into it. Could you describe your writing process? What was it like when you embarked on your first fiction endeavour? Has it changed, beome easier—or harder? I began with a concept—‘home’—and then worked out a backbone story of a young man who is discontented with his life and wanted to make a change in his life—and the lives of those around him—by getting himself an education. When he fails he has no other option but to leave his homeland. I wrote and worked out the plots along the way; this way, I could keep to my brief outline. I enjoyed the whole writing process—that’s the madness about writing: difficult but somehow fulfilling. As a child I read my neighbour’s collection of picture books in Chinese: The Happy Prince, The Little Match Girl, Crime and Punishment, The Merchant of Venice, and many others. When I started schooling, I was fascinated by the poems of the great Tang Dynasty and romantic classics such as the Dream of the Red Chamber, as well as tragic-romances from Taiwanese authors. I was also a great fan of swordplay fiction, especially those of the Crouching Tiger, Hidden Dragon variety, and would spend nights poring over the huge volumes of books. Which author occupies the most space on your bookshelf? At the moment it is V.S. Naipaul. I am working on a second novel that traces Mingzhi’s journey to Malaya in the early 20th century, reflecting the turbulent years between the 1900s and 1930s in the British colony. The book depicts the struggle of the Chinese immigrants in their new country. It also examines the concept of home for immigrants at a universal level.